One of the things President Cyril Ramaphosa listed as an achievement in his 2018 State of the Nation address was that “at least 187” ASIDI schools have been completed by the Department of Basic Education. The Accelerated Schools Infrastructure Development Iniative (ASIDI) was launched in 2011 with the aim of bringing basic services to schools that had no access to water, sanitation and electricity and to replace schools made of mud, wood and asbestos. An R8.2-billion grant, known as the Schools Infrastructure Backlog Grant (SIBG), was allocated to fund the work. 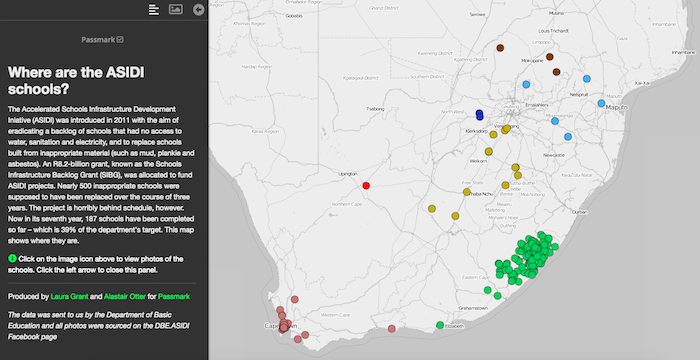 We built an interactive map with all of the completed Asidi schools. View it here. Treasury Budget documents from 2011 state that the funds would be used to replace 395 mud schools, mainly in the Eastern Cape, provide water to 1 307 schools, sanitation to 536 schools and electricity to 1 434 schools, over the course of three years, after which the grant would be discontinued. Two years later, in a presentation to Parliament in February 2013, the target number of schools to be replaced had grown to 496, and, in fact, at one point the number was 510. The number of schools that needed basic sanitation, water and electricity services also grew. Sadly, the project fell way behind schedule. Instead of building 496 new schools in three years, only 77 were completed. Now, four years later, with ASIDI in its seventh year, 187 schools have been completed, but that’s just 52% of the target – and that target has shrunk since 2013 to 363. The target numbers and “achieved” figures below are taken from a presentation made by the department of education to Parliament’s Portfolio Committee on Basic Education in early March 2018. Replacement schools targets and achieved were provided by a spokesperson for the department. “The original baseline was indeed 510 schools but with the rationalisation and mergers exercise in the Eastern Cape, that figure has since dropped to 363,” Albert Gumbo, a spokesperson for the ASIDI project, told Passmark in early March. This lower target means the department has therefore completed 52% of its target number of schools. But President Ramaphosa said in his SONA that all outstanding ASIDI projects will be completed by the end of the next financial year – that’s still 176 schools – a tough ask. So far, R8.7-billion has been spent on ASIDI projects. The Treasury this year allocated R3.7-billion over the next three years for the remainder of the work. Passmark got a list of 187 new schools that have been built through the ASIDI programme, mapped them and trawled through the ASIDI Facebook page for pictures of the new facilities. Click on the image below to view the map.